Do you need to sell protected or hidden products that only certain people can access? Use WooCommerce Protected Categories to protect your product categories. Do you sell unique products for each client, that no one else can see? Photographers, schools, sports clubs & other industries use our WooCommerce hide categories plugin to sell client-specific products - privately. The central login page directs each customer to their hidden category. WooCommerce Protected Categories is a popular wholesale plugin to create a hidden area for B2B clients or members. Your WooCommerce wholesale or members store is accessible only to those with the correct password or user role. No need to build a separate wholesale shop. Do you want to protect your whole WooCommerce Store? WooCommerce Protected Categories is perfect for protecting parts of your store or creating customer-specific products. To completely hide WooCommerce behind a simple password or user login, check out our WooCommerce Private Store plugin and make WooCommerce private. Create WooCommerce password protected categories. Customers enter a password on a central login form, and are redirected to the correct hidden category. Supports multiple passwords for each category. Restrict WooCommerce categories to specific user roles or individual users. Logged in users automatically see their protected categories, which remain hidden from everyone else. Once you've protected a WooCommerce category, its products and any sub-categories automatically inherit the same protection. Protect whole areas of your store in seconds. With our WooCommerce hide categories plugin, you can choose whether to show or hide your password protected categories and their products. Hidden content is invisible from public parts of your store. Optionally hide protected categories from menus and widgets. 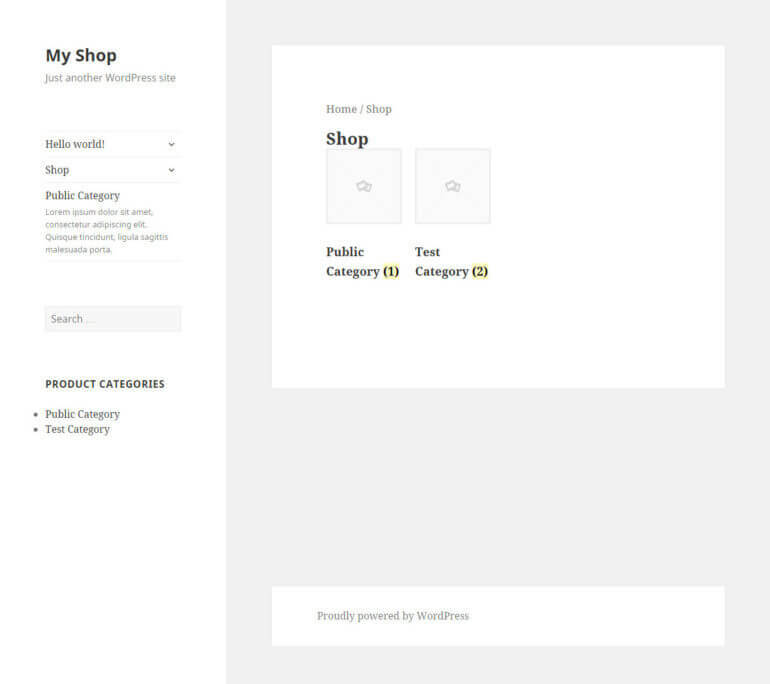 Watch the hidden menu links and widgets magically appear after unlocking a WooCommerce category! The plugin takes minutes to set up. Your customers simply log into their user account or enter a password to unlock an entire category, its sub-categories and products. Rated 5 out of 5 stars based on 23 customer reviews. Purchased the protected categories plugin and had some issues with getting it to work. Was my fault but their support was able to get the issue resolved right away. 10/10 will buy from them again. I use two plugins and after a little help both are working very nicely. Thank you for the amazing support during the install. Keep up your fabulous work. How does the WooCommerce Protected Categories plugin work? It provides a 'Visibility' option for each category (similar to that for posts and pages) allowing you to set the visibility to Public, Protected or Private. You can choose whether to make each WooCommerce category password protected, private, or restricted to specific WordPress user roles or individual user accounts. This makes it the most comprehensive WooCommerce protection plugin on the market. View the plugin demo to see it in action. Is this different to protecting individual WooCommerce products? This plugin improves on the basic options built into WordPress by allowing you to protect entire categories and all their products in one go. It also adds extra protection options so that you can restrict categories and their products to specific logged in users or roles. Not only does this save time, it's a more complete solution than having to password protect every product individually. How do WooCommerce password protected categories work? If you password protect a WooCommerce category, it will lock down the whole category and any products within that category. Users must enter a correct password in order to view the category page, or any individual products within that category or its sub-categories. Each category can have one or more unique passwords and you can protect as many categories as you like. Once a correct password has been entered for a category, it will 'unlock' that category so that the category page itself and any products within the category are visible and can be purchased. How do WooCommerce user and role protected categories work? 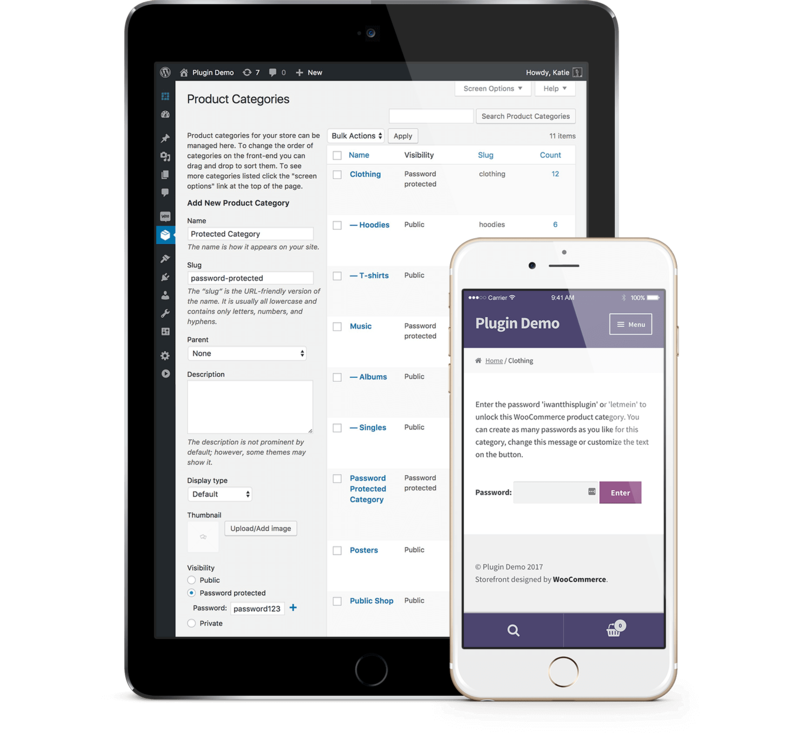 You can set any of your product categories to only be available to specific logged in users or entire user roles. Simply choose this option for the category, and select one or more roles/users. Customers with the correct role or user will automatically be able to access the category when they log into their user account. Can I hide protected product categories from my public shop? By default, protected WooCommerce categories and products are listed in the public store, but customers must enter a correct password to access them. If you prefer, you can completely hide protected categories (and their products) from the shop. Simply untick the box on the plugin settings page. This will hide them from your main store and other locations such as related products and sidebar widgets. You can also control whether links to protected categories appear in navigation menus. Public visitors will never know that your hidden categories and their products exist! Can I create customer-specific WooCommerce categories? 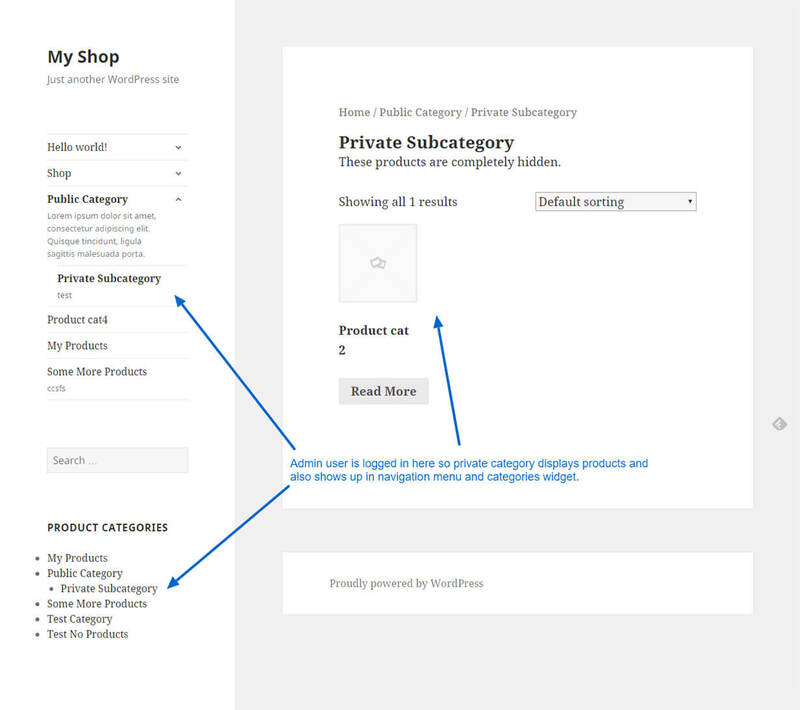 Lots of people use WooCommerce Protected Categories to sell hidden products that are only available to one customer. For example, photographers use it to sell photos that are personal to each client. Create one or more hidden categories for each customer and either password protect it or lock it down to a specific user account. For WooCommerce password protected categories, the customer uses the central login form and is automatically directed to their own hidden category. For user protected categories, we have provided instructions on how to direct each individual customer to their private category after logging into their account. Does it work with sub-categories? Yes, the plugin is fully compatible with WooCommerce sub-categories. Protect a parent category, and all its sub-categories (and their products) are automatically protected in the same way. The benefit is that if you have hierarchical categories, you don't have to protect each sub-category individually - just protect the parent category and you're good to go. What if my product is in more than one category? WooCommerce Protected Categories takes a secure approach where possible. If a product is in two categories - one public and one protected - the product will still be protected, even if accessed from the public category. If you want to sell the same product in a public and protected category, then we recommend using the free Duplicate Post plugin to quickly clone your products. Each product can only be in one password protected category. You can add a single product to multiple user or role protected categories. Can I make my entire WooCommerce store private? Yes! Simply protect all your categories. However, you might be better off with our dedicated WooCommerce Private Store plugin instead. Can I prefix the title of protected categories, like WordPress does for protected and private posts? Yes! Go to the plugin settings under WooCommerce -> Settings -> Products -> Protected Categories and tick Prefix names of protected categories. Protected categories will be prefixed "Protected: ". For example, a category called "Wholesale Area" would be renamed "Protected: Wholesale Area". We have tested protected WooCommerce categories thoroughly with a variety of free and premium themes and are confident the plugin will work with your theme. If you're using a theme that supports WooCommerce (i.e. includes its own WooCommerce templates), then it will work great as long as the theme uses the standard WooCommerce 'hooks' in its template files. Most - if not all - WooCommerce themes use these hooks so there shouldn't be a problem. Does it work with WPML? The WooCommerce Protected Categories plugin is officially certified as being 100% WPML compatible. This makes it easy for you to translate it into multiple languages. The plugin comes backed by our service. We work to continually add new features, important security updates, and provide expert customer support. The annual subscription enables us to continue developing and supporting the plugin long-term. You’ll be charged automatically once a year, and we’ll remind you beforehand. You can, of course, cancel at any time. We recommend keeping your subscription active because this locks in the current price, so the annual renewal cost will never increase. If you let your license key expire, then you can keep using the plugin but won't receive any more support or updates. Buy WooCommerce Protected Categories and start protecting your products today. Tested with WooCommerce 3.6, and replaced deprecated function warning. Fix: Bug when creating/editing categories if using an older version of WooCommerce (3.1 and below). Fix: Update to latest version of common code to prevent conflict with other Barn2 plugins. New: Improve category protection logic and provide better support for products in multiple categories. New: Compatibility with WooCommerce Quick View Pro. Fix: When 'Show protected products in store' was disabled, products in protected categories could sometimes still appear if the parent category was unlocked. 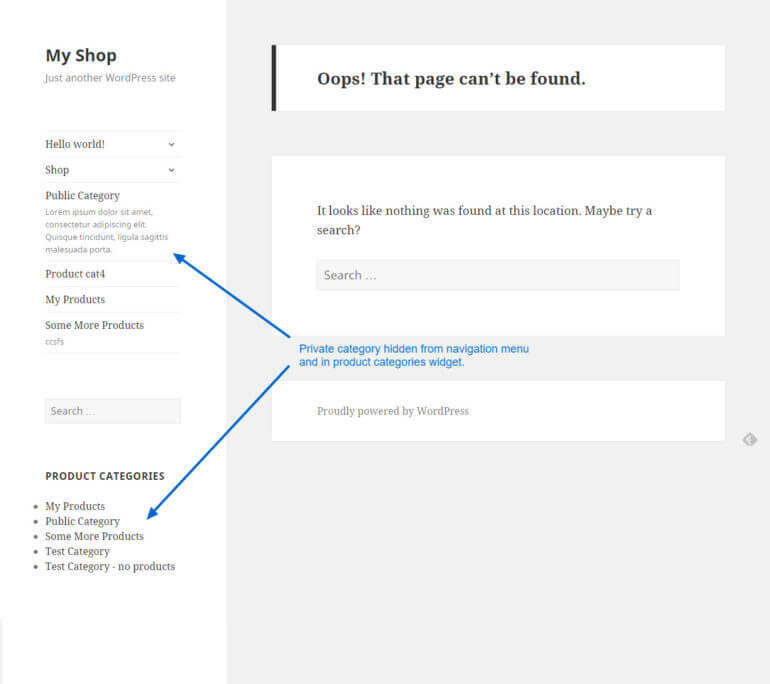 Fix: Products in multiple categories where one was unlocked could not be purchased from the shop page or archives. Fix: Remove 'pass by reference' for query in pre_get_posts hook to prevent possible PHP warning. Fix: Wrong protection type set when creating categories in admin. Tweak: Added category-password-required class to password login page (body class).